Deputy Attorney General Rod Rosenstein has one of the toughest jobs in Washington. He wants to ensure that the investigation into Russian interference in the 2016 election can proceed while also having to handle the increasingly frequent tantrums from President Donald Trump. The latest chapter in this ongoing saga started in late April when Trump called into his favorite morning cable news show for a live, on-air interview. Trump spent much of the 45-minute segment airing a series of personal grievances to Fox and Friends hosts, in an erratic, unhinged rant. He began yelling into the telephone, verbally attacking his own Justice Department, expressing his disdain for his own appointees — all while the show’s hosts, which are usually squarely in Trump’s corner, increasingly appeared uncomfortable. This week, he attempted to do just that. After spending a rainy weekend bunkered inside his Sterling, Virginia, golf club rage-tweeting, Trump returned to Washington on Monday prepared to drag the entire nation one step closer to a Constitutional crisis. 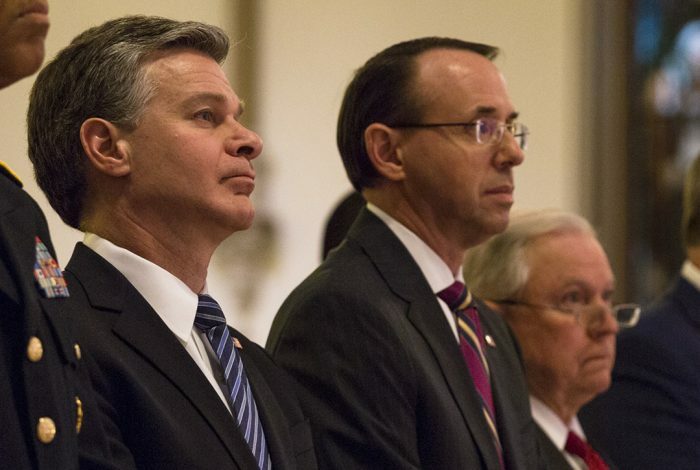 In an act of unprecedented executive overreach, Trump summoned FBI Director Christopher Wray, Director of National Intelligence Dan Coats, and Rosenstein to the White House Monday afternoon, in a blatant effort to protect himself from the special counsel’s criminal investigation. Trump initiated the meeting a day after launching a series of bombastic tweets, including a demand that the Justice Department investigate unfounded allegations that Obama administration officials infiltrated his presidential campaign for nefarious political purposes. Reports published last week confirm the FBI had been working with an informant inside Trump’s presidential campaign. The Justice Department responded shortly after Trump’s Sunday tweet, stating, “If anyone did infiltrate or surveil participants in a presidential campaign for inappropriate purposes, we need to know about it and take appropriate action”. While some may perceive Rosenstein’s immediate response as an appeasement to Trump’s abuse of power, others suggest the deputy attorney general is attempting a careful balancing act, doing whatever he can to protect the integrity of Special Counsel Robert Mueller’s ongoing investigation, while being pummeled by incessant threats and calls for impeachment from House Republicans. Rather than opening a criminal investigation into the president’s conspiratorial claims, Rosenstein forwarded the inquiry to Inspector General Michael Horowitz’s office on Monday. If Horowitz concludes intelligence officials intercepted communications between Trump campaign members and Russians during the Justice Department’s counterespionage investigation (spoiler alert: they did), the FBI’s use of a confidential informant to gain access inside Trump’s campaign would be deemed appropriate. It’s also worth noting that Trump and his team were warned by senior FBI officials back in August 2016 that Russians were trying to infiltrate their campaign. The White House Press Office issued a statement at the end of Monday’s meeting, stating Chief of Staff John Kelly plans to “immediately set up a meeting” with congressional leaders, the FBI, the Justice Department, and the director of national intelligence to review “highly classified and other information they have requested” related to the Russia investigation. Republican House Intelligence Committee Chairman Devin Nunes (R-CA) continues his efforts to sabotage the investigation, demanding the Justice Department hand over sensitive, classified documents, which would result in grave national security consequences and expose confidential counterintelligence sources. Additionally, any classified information made public would undoubtedly be shared with the president, in an effort to assist his defense against prosecutors. One source, in fact, was revealed on Sunday, after former Trump campaign surrogate Sam Nunberg blurted out his name during an MSNBC interview. Nunberg is now a cooperating witness in Mueller’s probe. Mr. Rosenstein, America looks to you to uphold the independent integrity of the justice system. Godspeed.